What is a Mississippi Quit Claim Deed? Mississippi Quit Claim Deed: What Is It? 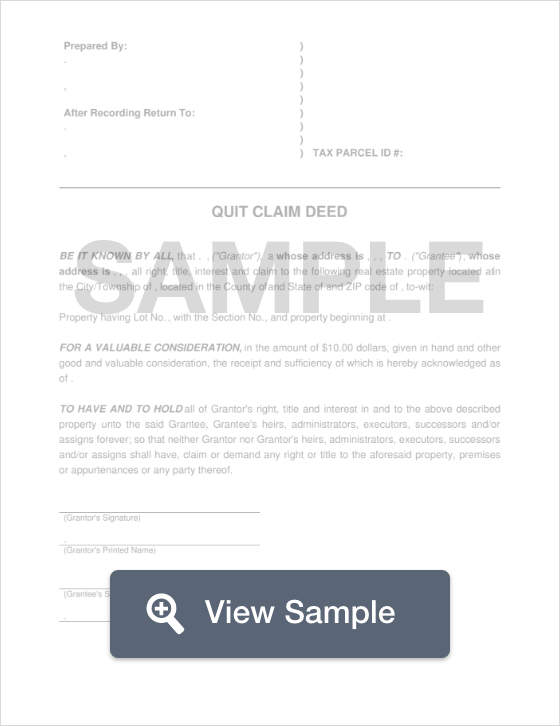 A quit claim deed in the state of Mississippi is a legal document that transfers property from one person to the next. It’s important to note that the transfer if a property via this document comes with no guarantees as to whether or not the property has a clear title. Generally, this type of transfer is conducted between family members, but can also be used for expeditious property transfers. It is important to note that a quit claim deed only transfers ownership interest from the seller to the buyer, and provides no guarantee that the seller even has the legal authority to sell the property. Because of the unknown factors that come with the expeditious manner of a quit claim deed, it is highly recommended that the buyer conduct a thorough title search before proceeding with a quit claim deed transaction. Recording - According to Mississippi Law, all quit claim deeds must be filed with the Clerk of Chancery’s Office in the county where the property is located. In addition, the state of Mississippi requires the telephone numbers of both the buyer and the seller to be included in a quit claim deed (§ 27-3-51). Signing - The seller of the property must sign the quit claim deed in the presence of a Notary Public (§ 89-3-7).